This coverage of the 2017 National Investment Center for Seniors Housing & Care Spring Investment Forum is brought to you by Mainstreet. As the nation’s largest developer of transitional care properties, Mainstreet specializes in real estate development, value investments and health care. With Mainstreet’s support, SHN is bringing live event coverage of the NIC conference, which draws developers, providers and operators within the post-acute and preventative health care services space. With the fate of the American Health Care Act hanging in the balance, former Senate Majority Leaders Bill Frist (R-TN) and Tom Daschle (D-SD) offered their take on what the future might hold for the senior housing and care industry. Senior housing is a “growth industry,” and he would choose memory care if he were given $1 billion to invest in the sector, due mainly to the huge future need in this area, Frist said Thursday during a keynote speech at the National Investment Center for Seniors Housing & Care (NIC) Spring Investment Forum in San Diego. Daschle (pictured above) concurred on the importance of memory care and said it could lead to private-pay assisted living being a bigger player with major health plans in the future. While a White House spokeswoman predicted that a vote would occur on Friday, the postponement fueled speculation that Trump and Speaker of the House Paul Ryan (R-WI) are struggling to garner enough votes to pass the legislation. The bill ultimately will pass the House in some form, Frist predicted. But should this happen and a law ultimately go on the books without bipartisan support, the country likely will be right back in this situation in the future, he and Daschle warned. In part that’s because health care is so complex that any reform effort is sure to be imperfect, requiring swift and constant “iteration” to get right; this type of revision isn’t possible without some cooperation across party lines, Frist argued. For the beleaguered skilled nursing industry—where Medicaid is the largest single payor—this will put even more of a premium on being a high-quality provider. That’s because the evolution of paying for value more than volume will continue, and the fight over scarcer dollars will make it more critical than ever to be best-in-class. In a wide-ranging discussion, Daschle and Frist emphasized the importance of technology to deliver high-touch care, and the need to keep building collaborative relationships across the continuum. 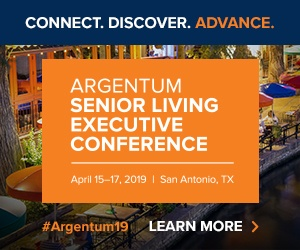 The messages resonated with at least one member of the audience: Jack Callison, CEO of Chicago-based Enlivant, one of the largest senior living companies nationally.